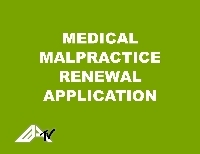 Please join us on Friday, November 9th at 10:00 a.m., where we will review the Medical Malpractice Renewal Application with Linda Garrett of Garrett Consulting. This is your opportunity to see the brand new application format, ask questions and to gain an understanding of what information we need and why. If you are interested but unable to attend, the webcast will be recorded on EIA TV allowing you to view it at a time more convenient for you.